In May 2014, Azerbaijan assumed the chairmanship of the Council of Europe, whose key mandate is the strengthening of human rights and democracy in Europe. When, last June at the Parliamentary Assembly of the Council of Europe in Strasbourg, Azerbaijani President Ilham Aliyev was approached with regard to the human rights situation in his country, he claimed that “all the fundamental freedoms” were provided in Azerbaijan. In January 2014, he had underscored that there were no political prisoners in the South Caucasian state. These statements strongly diverge from reality: While the Azerbaijani constitution de jure guarantees freedom of press and opinion, according to the reports of various independent nongovernmental organizations (NGO), both have been systematically stifled for years; in 2014, “Freedom House” assessed Azerbaijan the 11th consecutive time as “not free”. According to the Press Freedom Index of “Reporters Without Borders”, in 2014, Azerbaijan is ranked 160th out of 180 in international comparison. As per a list of the Azerbaijani “Institute for Peace and Democracy”, in May 2014, 130 persons were being held in Azerbaijani prisons for political reasons. In a report published in 2013, “Human Rights Watch” bashed an increasingly radicalizing spiral of repression of civil society in Azerbaijan. In Azerbaijan, the political transition from Soviet system to independent statehood proceeded quite differently than in its two neighbouring countries Georgia and Armenia. In the spheres of influence of Tbilisi and Yerevan, former and new elites engaged in bloody power struggles, and strong oppositional parties, acting as stimulus for democratic progress, were able to take root. In Baku, on the contrary, pluralism was pushed back to a merely symbolic position after a brief democratic interplay under President Abulfaz Elchibey. In 1993, Heydar Aliyev, former chairman of the Azerbaijani KGB and highly decorated functionary of the CPSU, succeeded in regaining government power, which he had held between 1969 and 1982. Until he died and was replaced by his son Ilham Aliyev in 2003, President Heydar Aliyev used authoritarian means to consolidate the power position of his family and secured it enormous shares in the thriving Azerbaijani oil drilling branch and other key industrial sectors. With the help of huge revenues from the petroleum industry, which, between 2001 and 2011, led to meteoric growth of Azerbaijan’s economy, the government was able to considerably reduce nationwide poverty; in 2001, 49,6 % of the Azerbaijani population lived below the breadline, in 2012, the overall share had shrunk to only 6 %. An additional key focus of the government was military build-up in the context of the Azerbaijani-Armenian conflict over the Nagorno-Karabakh region. In 2013, the military budget of Azerbaijan added up to 1,4 billion euro. Despite high export revenue, the government paid only very limited attention to sustainable development and diversification of the economy, also, the emergence of free market economy was considerably hampered by the existence of widespread networks of corruption and nepotism. What is more, over the last two decades there was almost no progress in the fields of democracy and rule of law. Since 2011, the output of the Azerbaijani petroleum industry has been in continuous decline. This development is critical for the socio-political stability of Azerbaijan, for it might entail strong cutbacks in welfare spending, which has primarily been financed out of oil export revenues and saved large parts of society from falling into absolute poverty. As a reaction to the losses of the oil industry, the government significantly raised petrol prices throughout the country; this dramatically sped up the overall price growth, especially in the sector of groceries. After the 2010 parliamentary elections, which were harshly criticised by domestic and international election monitors, it began a number of mass protests expressing Azerbaijani civil society’s increasing outrage about the Aliyev government. While the majority of the demonstrators were followers of the opposition parties “Müsavat” (eng. : Equality) and “Azərbaycan Xalq Cəbhəsi” (eng. : Popular Front), an increasing amount of them were supporters of youth movements such as “NIDA” (eng. : Exclamation Mark) and “Azad Ganclik” (eng. : Free Youth). The demonstrations were directed against rising costs of groceries and petrol, the inefficiency of the government, which continues to be characterised by high corruption and conservatism, and for freedom of press and speech, economic reform and social equality, as well as for the release of political prisoners. The protests, which had been organised along the lines of “Arab spring” mentality, were brutally dispersed by the government. As a reaction to the demonstrations, as well as in preparation for the presidential elections of 2013, the government stepped up its repressive activity against defiant bloggers, journalists, opposition politicians and activists. A frequent symptom of the repressive measures taken by the Azerbaijani authorities against system-critical, politically active citizens is intimidation and, if no self-censorship ensues, their arrest on the basis of bogus charges. There have been frequent complaints about torture and police violence towards inmates, opponents of the regime run the risk of excessive prison terms under abominable conditions. In recent months, there have been a growing number of examples for politically motivated arrests and sentencing of members of the Azerbaijani civil society and political activists: In March 2013, Rashad Hasanov, Shahin Novruzlu, Uzeyir Mammadli, Bekhtiyar Guliyev, Mahammad Azizov, Zaur Gurbanly, Rashadat Akhundov and Ilkin Rustemzade, leading members of the Azerbaijani youth opposition party “NIDA” were arrested. They were accused of planning the organisation of violent riots for a demonstration on March 10, 2013. Furthermore, they were charged with drug posession, illegal posession of weapons and other crimes. According to a report by “Human Rights Watch”, the protest proceeded peacefully, until it was violently dispersed by police, which arrested about 100 participants of the event. On May 5, 2014, after 20 days of hunger strike, the eight activists were sentenced to prison terms between six and eight years. On April 19, 2014, Rauf Mirqadirov, a correspondent of the independent Russian-language newspaper “Zerkalo” (eng. : Mirror) was deported from Turkey, where he had been legally living with his family and working for three years. He was brought to Baku, where he is now in pre-trial detention for alleged espionage. Mirqadirov is known as a liberal journalist who has repeatedly criticised the politics of Turkey’s President Erdogan and Azerbaijani President Aliyev. On March 17, 2014, Tofiq Yaqublu, vice chairman of the opposition party “Müsavat” and Ilqar Mammadov, leader of the opposition party “Respublikaçı Alternativ” (eng. : Republican Alternative), were sentenced to five and seven years, respectively, of imprisonment. They were charged with disrupting public order and arson in the context of mass protests that escalated in the Azerbaijani city of Ismailli in 2013. On May 26, 2014, Anar Mammadli, chairman of the “Election Monitoring and Democracy Studies Centre” was found guilty by the Azerbaijani authorities for tax evasion, abuse of office, illegal entrepreneurship and other alleged crimes; he was sentenced to five and a half years of imprisonment. His organisation, which specialises in election monitoring, had criticised the 2013 Azerbaijani presidential elections. On April 28, 2014, Leyla Yunus, one of the leading human rights activists of Azerbaijan, as well as director of the Baku “Institute for Peace and Democracy” and her husband Arif Yunusov were prevented from boarding a plane from Baku to Paris. It ensued a search of the couple’s house and office, as well as a 9-hour interrogation of Mrs Yunus. The behaviour of the police was described as intimidating and humiliating. Leyla Yunus was primarily questioned as to her contact with members of the Armenian civil society and journalist Rauf Mirqadirov. On June 30, 2014, Leyla Yunus and her husband Arif Yunusov were arrested. The couple is being accused of spying for the Armenian secret services and of evading taxes. Arif Yunusov was released for health reasons and put under domiciliary arrest, while Leyla Yunus is now, for approximately three months, in pre-trial detention. She suffers from severe diabetics and it is unclear, if she is being given sufficient access to care. The repressive course of the Azerbaijani regime is especially well attested by a number of recently passed laws: In May 2013, for instance, the existing law against criminal libel and insult was broadened to inclued the internet and public demonstrations. The maximum sentence for libel and insult amounts to three years of imprisonment. Since 2006, no demonstrations have been allowed in the centre of the Azerbaijani capital Baku. Since Nomember 2012, participants of unsanctioned public gatherings run the risk of being fined penalties of up to 7,600 euros. On March 13, 2013, the Azerbaijan’s government passed changes to the legislation on NGOs. These changes further complicate the management and registration of NGOs; if various formalities are not complied with, NGOs may be fined excessive penalties while their premises can be confiscated by the authorities. In May 2009, President Aliyev further consolidated his power by pushing through a controversial referendum on a change of constitution, which abolished the two-term limit of the presidential office. Europe – Paragon of Virtue or Accomplice? In the context of the 2013 presidential elections, Ilham Aliyev was re-elected a second time with a stunning majority of 84,5 % of the votes. Shortly after the elections, the election monitoring missions of the European Parliament (EP) and the Parliamentary Assembly of the Council of Europe (PACE) evaluated the elections as free, fair and in compliance with European guiding principles, while the Organisation for Security and Cooperation in Europe (OSCE) criticised severe shortcomings. Among others, they found fault with the regulations of freedom of opinion and assembly, the intimidation of voters in the run-up to the elections, as well as methodical fraud on election day. Eventually, the EP reversed its estimation of the presidential election and backed the assessment of the OSCE. In 2009, the Council of Europe commissioned German MP Christoph Strässer to draft a report on political prisoners in Azerbaijan. The Azerbaijani government reacted by denying Mr. Strässer to enter the country. In January 2013, the PACE voted on a resolution based on the report that Strässer had written after consulting various human rights organisations and Azerbaijani dissidents. The resolution urged the Azerbaijani government to release all political prisoners and to stop prosecuting citizens for political reasons. The resolution was rejected by the PACE with 125 to 79 votes. Critical voices connected the discrepancies among the election monitoring groups in Azerbaijan and the absurd rejection of the resolution against political prisoners by the PACE to the Baku offensive of lobbyism, which has been known for some years by the name of “Caviar Diplomacy” (PDF). In 2001, under President Heydar Aliyev, Azerbaijan joined the Council of Europe as 43th member state. Since then, there have been multiple reports about the ruthless manner, in which Baku informally furthers its interests abroad. 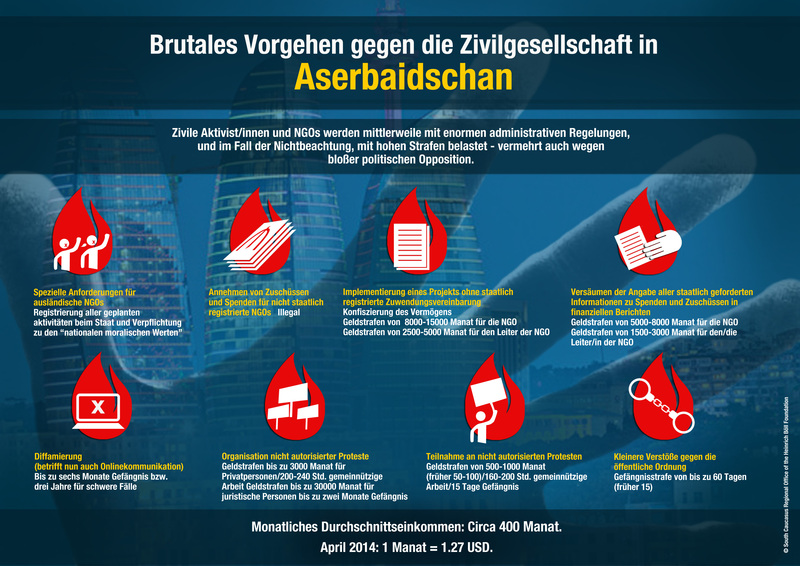 Apparently, its main instrument in this matter are lobby organisations financed by Azerbaijan, as for instance the “Gesellschaft zur Förderung der deutsch-aserbaidschanischen Beziehungen” (GEFDAB) (eng. : Society for the Promotion of German-Azerbaijani Relations) or the “European Azerbaijan Society” (Teas), which are known for inviting high-ranking European politicians as well as delegates of the PACE on expensive paid-for trips to Azerbaijan. Luxurious hotels, massive quantities of caviar and other nobel gifts seem to be common practice. While, oficially speaking, neither of the two organisations is directly linked to the Azerbaijani government, they are obviously assisting Baku’s political elite, which is very much interested in window-dressing its international reputation, inspite of its dire human rights record. At the same time, the West is in fact quite interested in good relations with Azerbaijan, since the Caspian Sea littoral state disposes of the third-biggest oil drilling industry in the post-Soviet space, just after Russia and Kazakhstan. Futhermore, Azerbaijan holds considerable quantities of natural gas and functions as transit country for oil and gas imports from Central Asia. This is why, for the European Union (EU), it is an important partner in the fields of infrastructure and trade. The recent Ucraine crisis, which raised general awareness of the instability of Russian energy supplies for Europe, prompted the EU to step up its quest for the diversification of energy imports, which would decrease European dependence on Russia. Azerbaijan’s geopolitical position in the spheres of interest of EU and USA, as well as of Russia, Iran and Turkey permits its government a rare diplomatic standing and the balanced negotiation of lucrative contracts with various actors instead of an association agreement with either Eurasian Economic Union or EU. The “Southern Gas Corridor”, a competing project of the Russian-financed “South Stream”, is a network of planned and already existing pipelines that has been projected to transport natural gas from Central Asia, the Caucasus and the Middle East to Europe. Since Azerbaijan’s participation is considered essential for the success of the project, a serious intervention in the domestic affairs of the Aliyev government from the part of the West is currently a delicate matter. All the same, it is crucial that Europe stands up for the democratic values to which it has committed itself. To support the present socio-political status quo in Azerbaijan is by no means a sustainable strategy. In this respect, the Azerbaijani chairmanship of the Council of Europe is a disgrace; although, already with its affiliation to the institution in 2001, Azerbaijan pledged itself to release all political prisoners and end repressive activity towards the political opposition, since then, the situation has even more deteriorated. The fact, that representatives of the top echelons of European governments have agreed to hand over the supervision of the chief institution for the promotion of human rights in the European region for half a year to a state that doesn’t even comply with its membership conditions and where human rights are trampled on, considerably puts in question reliability and ethical acceptability of the European value system. The corruptibility that apparently is on the advance in the Council of Europe and the EP and which, nourished by Azerbaijani-paid European lobby organisations is undermining a consistent European human rights policy, is a problem, which has to be tackled urgently. Since it is clearly not perforce pragmatism that prompts Europe to overlook Aliyev’s repressions. While, as part of the “Southern Gas Corridor”, the Azerbaijani transit route is important but not indispensable for the diversification of European energy imports, for Azerbaijan it is not only of high economic but also political significance: In the context of Putin’s Eurasian vision, Azerbaijan’s alignment with Russia, which is the most obvious alternative to a cooperation with Europe, would most probably entail considerable losses for the sovereignty of the Azerbaijani state. This is why the EU has a rather favourable position when negotiating this matter with the Baku elite. This elite has proven quite dexterous in its efforts to preserve the socio-political status quo in Azerbaijan and has succeeded in influencing European decision makers via informal, luxurious backdoors. Despite Azerbaijan’s strategic and economic importance for Europe, the EU and the Council of Europe should develop a consistent policy towards Azerbaijan and clearly condem the human rights situation in the country. At the same time, further economic cooperation must be attached to democratic reforms that noticeably improve the position of civil society in Azerbaijan. Simultaneously, it is vital to strengthen democratically oriented actors in the country and to support them in the promotion of pluralistic Azerbaijani politics.